Domiciliation: Bless this House Installation, 2019 Statement & Inventory! !! Domiciliation: Bless this House is a new mixed media installation that features a series of digital collaged images silkscreened onto layers of clear polyvinyl chloride (PVC) material displayed as both wall hangings and three dimensional storage containers.! ! 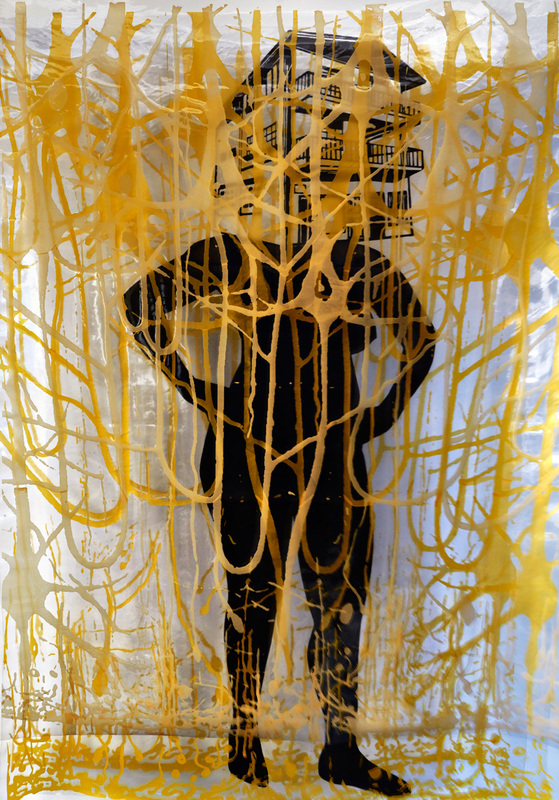 The 6ft x 4.5ft wall hangings captures a liminal figure maneuvering in space wearing a house structure as a mask or headdress, and engulfed by silkscreened layers of neurons. The house structure is a replication of my maternal family home in Grenville, Grenada, built in the mid 20th century. The house survived a fire in 1986 and two hurricanes in 2004 and 2005. In both man-made and natural disasters the family lost primary records, personal ephemera and photos that could never be replaced. To salvage and protect what’s left of my family’s history and ensure that it’s preserved and passed on to my son’s generation, I’ve constructed a series of three dimensional polyvinyl chloride storage containers to function as a repository for my maternal family’s history.! ! Domiciliation: Bless this House Installation is also a personal examination into notions of selfhood. Contemplating both the interior and exterior spaces of black womanhood. What does it mean to embody a place or have the ability to locate oneself in a space? How do I create imagery that is not based on mimicry or in relation to others but rather iconography that moves my black female body beyond servitude, violence, trauma, and exploitation to one that exudes my beauty, and complexity? ! ! My intention is to construct a narrative that captures the hybrid and transitional nature of my Americaness, Caribbeanness and In-betweeness. The installation is designed to center my life, the lives of my family, and our transgressions as the subject of history. The work draws inspiration from Grenadian-American poet and activist, Audre Lorde’s “biomythography” concept, which blends biography, history, and myth to present the black female existence and lived experiences through and alongside the numinous. ! ! connectedness I feel to a place, home, land, and country that my parents physically left yet deeply embody. A trans-generational history, they’ve endowed onto my generation. This installation is a monument to the Mark-Munro Family Legacy.! Domiciliation: Bless this House Installation Wall Hangings! Wall Hangings: mixed media silkscreen prints on 20-gauge clear polymerizing vinyl chloride (PVC) sheets with thread and fabric trimming! 6ft x 4.5ft / 182.88cm x 137.16cm (individual PVC sheets)! *wall hangings must be mounted onto the wall surface 90 inches / 228.6cm height from the ground and require a low lit room with spot lighting ! Domiciliation: Bless this House Installation Storage Containers ! Storage Containers: mixed media digitally collaged family photos and records silkscreened onto 16-gauge clear polymerizing vinyl chloride (PVC) sheets, constructed into 3D forms using polypropylene webbing with thread and fabric trimming. ! One-of-a-kind Print Storage Containers ! *storage containers must be displayed freestanding on and pedestals and suspended from ceiling hanging mechanism! Domiciliation: Bless this House Installation Storage Container #1 ! 15in x 20in x 35in / 38cm x 50cm x 88cm! * installation requirement: ceiling hanging mechanism & spot lighting ! ! Domiciliation: Bless this House Installation Storage Container #2 ! 30in x 22in x 18in / 76cm x 55cm x 45cm ! Domiciliation: Bless this House Installation Storage Container #3! 29in x 18in x 12in / 73cm x 45cm x 30cm! * installation requirement: low & wide pedestal with spot lighting ! ! Domiciliation: Bless this House Installation Storage Container #4 ! 25in x 8in x 25in / 65cm x 22cm x 65cm ! * installation requirement: square pedestal (3ft / 91cm height preferable) with spot lighting ! 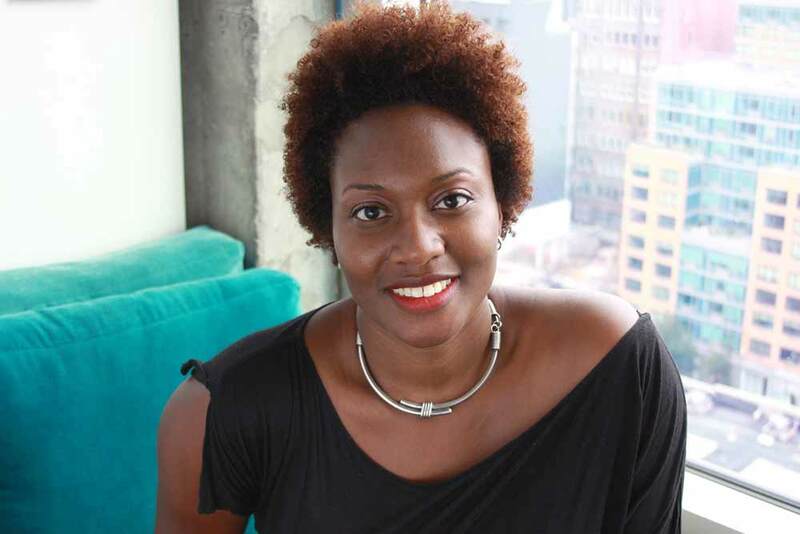 Shervone Neckles is an interdisciplinary artist, educator, and community worker. Neckles’ draws inspiration from the duality and transitional nature of her Afro-Grenadain, American identity. Her work embraces collage, alternative printmaking techniques, book arts, sculpture and social investigations. 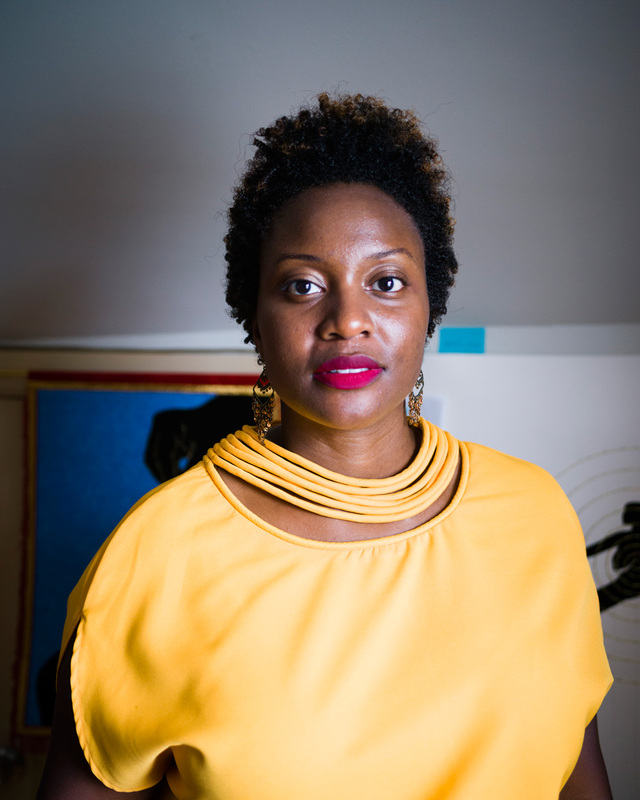 She has participated in residencies as diverse as the Youlou Arts Foundation in St. Vincent and the Grenadines, WI; Robert Rauschenberg Foundation, FL; The Elizabeth Foundation’s SHIFT Program, NY; The Center for Book Arts, NY; The Skowhegan School of Painting and Sculpture, ME among many other residency programs. Previous awards include grants from The Queens Council on the Arts, Foundation of Contemporary Art, Puffin Foundation, Joan Mitchell Foundation, and fellowships from Robert Blackburn Printmaking Workshop and Manhattan Graphic Center. Her award-winning work has been shown worldwide in both group and solo exhibitions and will be featured in the 2019 Venice Biennale’s Grenada Pavilion. Her practice also includes curatorial projects; Amplify Action: Sustainability through the Arts with Pratt Center for Community Development and Bedford-Stuyvesant Restoration Corporation in Brooklyn, NY; and From Taboo to Icon: Africanist Turnabout at the Ice Box Galley in Philadelphia, PA. Neckles’ has earned an MA from Teacher’s College, Columbia University, MFA from Queens College and BFA from The College of New Rochelle. Neckles’ currently lives with her partner, artist José M. Ortiz and six year old son in Queens, New York. Download artiste statement as a pdf. Download artiste biography as a pdf.